A draft set of plans have been shared with us of how to improve Nelson Street for cycling and walking, after the changes made for MetroBus. If you can understand plans have a look and tell us what you think. There’s a set of photos below which show the current problems. These are part of the Cycle Ambition Fund programme North-South route. We don’t consider the proposals go nearly far enough for this key walking and cycling route. It’s long been recognised as the main artery connecting the Harbourside and remodelled Centre with the shopping areas of Broadmead and Cabot Circus, avoiding the horrid traffic on Lewins Mead and Rupert Street. It’s important to note that these are initial draft plans and not a finished design, in particular there is no design information on final levels and surfaces, or on improvements to the wider public realm to make the street more pleasurable to walk or cycle down. The text of our response is below, or click here. These plans follow on from the 2015 report Improving the Public Realm in Nelson Street. This included the aspiration to reduce general traffic movements through the area and enhance Nelson Street as a walking and cycling corridor as Nelson Street will become an even more popular route following the redevelopment of the Centre through the Metrobus project. Making Bridewell Street one-way in from Rupert Street with a contraflow cycle lane. Relocation of the existing part-time taxi bays on Nelson Street from the north to the south end of Bridewell Island. They have more flexibility of routes in this location. Here are selected photos from BCyC member Sam Saunders illustrating the current problems. 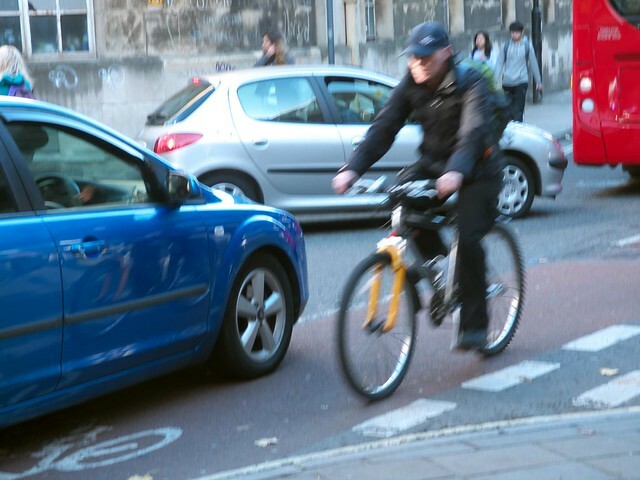 Bristol Cycling Campaign OBJECTS to the proposals. Our general view is that these proposals do not work well for cycling or for walking. Nelson Street was planned, in recent years, to be a primary pedestrian and cycle route. Using it as a main bus route is incompatible with that intention. It is a fairly narrow city-centre street where bus use has been prioritised at the expense of more sustainable travel modes. The plans for Nelson St set out in the Regeneration Framework and Public Realm Strategy, are sadly failed by these disappointing proposals. The Strategy describes a 4 metre wide fully segregated two way cycle track. In the decade since the Framework many other cities (eg London, Portsmouth, Manchester, Leicester and Cambridge) have increased, not decreased, their provision and aspiration for cycling. It is sad to see Bristol moving the other way, when we once led these changes with Cycling City. Prioritising buses, so that one bus may overtake another will make Nelson Street more unattractive for people on foot or on bikes. Nelson Street is already a busy route for buses and increasing bus frequency should lead to more, not less, protection for cyclists. People on bikes heading towards Broadmead will have to overtake buses which are pulling into a bus stop, a difficult and intimidating manoeuvre. This is not all inclusive, all abilities 8 to 80 cycling. It will continue to limit cycling in Bristol to the bold and brave minority. There is an alternative: Rupert Street and Lewins Mead are multi lane one way motor roads and both have bus lanes. They are 1 or 2 minutes walk away from Nelson Street and some buses stop on both Rupert Street and Nelson Street (eg 1,2,8,9,48,49,72) despite the short distance between them. Others stop on both Nelson Street and the Horsefair, also a few minutes walk apart (eg 1,2,8,6,9,36,42,42A,43,44,45,72). We think more consideration should be given to keeping some buses on Rupert Street and/or Lewins Mead and to making others nonstop on Nelson Street. This is in keeping with modern thinking on bus use (quicker journeys, fewer stops; eg Metrobus). We agree with the comments of the Bristol Civic Society (BCS) about reducing bus movements on Nelson Street. We also question whether consideration should be given to moving one Nelson Street bus stop to either Bridewell Street or Christmas Street, assuming space could be created. We query whether, with better design and planning, it would not be possible for Nelson St to have one bus carriageway, whether throughout or at its pinch points, with fewer buses (particularly fewer stopping buses); thus enabling this vital walking and cycling route to be massively enhanced for the benefit of all. We are concerned that if cyclists and walkers are discouraged from using the Nelson Street route there is no obvious alternative at present. We cannot understand the logic behind these proposals, certainly taken in isolation. It is possible they will make sense in the context of the awaited City Centre Movement Strategy (CCMS), which we have not seen. We also have a concern that unless the segregated contraflow is very clear and not simply a pavement with lines painted on, cyclists will continue, as they do at the moment, to ride on the roadway towards the Centre, unaware that the on-carriageway contraflow has gone. Crashes may occur in our view that alone is unacceptable, and should lead to reconsideration of these proposals. Nelson Street is currently a messy chaotic street (photos). These proposals will do nothing to change that. We do not want people who are travelling by bike and on foot to be arguing with each other over the small space left over to them collectively, by putting other modes of transport first. We should not be put in that position; it happens as a result of bad design. We note Bristol Civic Society (BCS) and Bristol Walking Alliance (BWA) have made suggestions for public realm improvements. We would not object to these provided they did not interfere with cycle movements in the confined space given over to the segregated cycle contraflow. As public realm, non cycling measures they should not be paid for from the Cycle Ambition Fund primarily or disprortionately. We note BWA have suggested a wider pavement. We would agree but only provided it does not reduce the already narrow contraflow cycleway, which must not be reduced further below 1.5 metres. If a decision has been taken not to give Nelson Street a two-way protected cycle way we would, regretfully, support the contraflow segregated cycle route. It is necessary to retain the contraflows on Christmas Street and Bridewell Street. Both are used and useful. We welcome the splitter islands in providing a measure of protection for cyclists. It is important the cycleway is separated by height, surface and colour from both the roadway and the pavement. The draft plans show the cycle contraflow as being only 1.5 metres wide for much of its length. This is regrettable: it will divert cyclists (when the cycle track is blocked with pedestrians or parked vehicles) to use the roadway and/or the footway. Providing a wider, better quality facility would reduce or eliminate this. It is also regrettable there will be no provision for cyclists on Quay Street beyond a bit of white paint. A proper proposal would have continued the two-way segregated cycle track along Quay Street. We support a northbound off-carriageway contraflow on Fairfax Street. This is a potentially useful route from Wine Street and Castle Park (the outside of which has great potential for cycle routes) via the Pithay to Nelson Street and beyond. If this proposal, having already been downgraded from a two-way protected route to a one-way protected route is further downgraded to “shared space” that would be extraordinarily disappointing. Shared space is not appropriate for an already busy cycle route. We support the proposed speed tables at the junctions of Nelson Street with Christmas St, Bridewell St and All Saints St and the speed table on Nelson St. Finally we seek a clear commitment from BCC to address disjointed thinking, which is inevitable in large bureaucracies, by consulting (privately or publicly) at early conceptual stages in design and to understand that consultation is a vital tool in changing and improving plans. Fine aspirations and intentions for walking and cycling on Nelson Street have been surrendered to a need, perceived or real, to prioritise buses as a result of other developments (Metrobus redesign of the Centre and Callowhill Court). This must be avoided in the future so widespread cycle travel can become a reality. Please when planning public transport changes or improvements, which we accept are often necessary or desirable, think about their impacts on active travel and, if it is adverse, pause, consult, reconsider and perhaps revise.